Meme I bought them as a gift and the kid can not put them down. They are very durable!! Mom-Mom We bought this for our 19-month old son, despite the recommended age levels. There are eight three-letter words & eight four-letter words on wooden planks. Each plank features a word on each side & brilliant, colorful paintings of the items--i.e. cat, dog, hen, pig, cow, bus, car, sun. 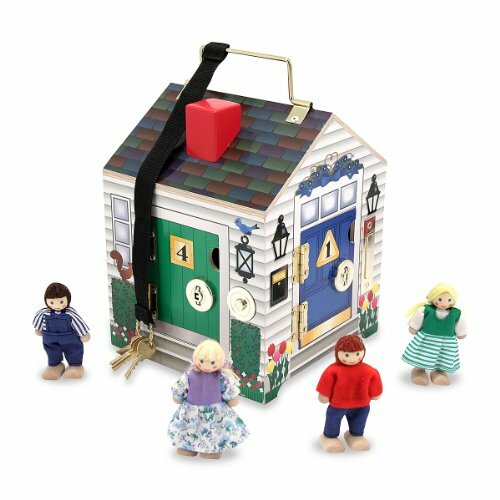 The toy has cut-outs of individual alphabet letters to insert into the plank in a puzzle-like fashion. This is a wonderful tool for tactile learning, & I was impressed with the number of activities to devise using the toy. For our son, we get out one plank at a time & only the letters that spell those specific words. It would be best to provide guided instruction--not just hand a child every piece of the set & expect him/her to figure it out on his/her own. It can be overwhelming to younger children, but if you take it slowly, one word at a time, it is an effective sort of training for recognizing letters & how to spell words. The only improvement that I would suggest is to somehow add a sound button inside the puzzle fittings. That would provide an auditory element that may be helpful for certain types of learners. 2 girls Mom This is a wonderful learning toy. My 2 1/2 year old loves it. She was good with recognizing capital letters, so this toy has been great for her to see and work with lower case letters. The pictures reinforce the word and she is so excited to "read" and spell on her own. We work the puzzles together and she will also sit and play with this toy on her own. The wooden pieces are colorful, sturdy and easy for small hands to manipulate. The box it comes in is the perfect storage with a heavy duty clear plastic lid that slides on and off. julesintex This is a wonderful learning toy. My 2 1/2 year old loves it. She was good with recognizing capital letters, so this toy has been great for her to see and work with lower case letters. The pictures reinforce the word and she is so excited to "read" and spell on her own. We work the puzzles together and she will also sit and play with this toy on her own. The wooden pieces are colorful, sturdy and easy for small hands to manipulate. The box it comes in is the perfect storage with a heavy duty clear plastic lid that slides on and off. BTC I like that the cards are two sided and that there are enough letters to fill each card on one side. I also like that there are a variety of word lengths. Sherri My three year old can entertain himself with this set for over an hour. It is great for reinforcing letter recognition, and sounding out small words. I am hopeful that it will help with sight reading over time. My five year old is not as amused by it, but the boys have different personalities. This is great for children who love shapes, puzzles, tanagrams, imagintive play, like my three year old who prefers his child-powered wooden trains to a movie. My five year old is a gadget boy - he prefers anything electronic and interactive, with lots of stimulation. The product is nicely made, attractive, and in the spirit of Montessori style play materials by Melissa and Doug self correcting and simple. The quality is typical of Melissa and Doug materials, and young children are naturally attracted to the bright colors and wooden material. CaptCsMrs This is a fantastic toy! I purchased it for my 3 year old about 2 months after his birthday and he LOVES it. It has been very educational and he can now spell almost everything and it has really helped him to start reading! Very impressed. momof3 This product would be better if it didn't spell the words for you. I use it more for my 2 1/2 year old, but it even seems to easy for him. He doesn't have to try to sound out the word and guess "what does bus start with" because it's already spelled for him. With that said, I think it's a great beginning tool for young children just beginning letters and sounds. jlo My 3 year old son loves this! It is a quality toy that makes learning fun. Just keep the letters in a ziplock bag so they don't get lost. kboston This toy seems like it would be an excellent way to introduce reading. But I would agree that this toy is rather easy, even when your child cannot read yet. I think it can help a child to get introduced to the process of spelling. My daughter is three now, but she could put all the letters together probably before age two, just by matching the shapes of the letters. It was great to see her work with the letters and reinforce the alphabet with her. But I can't say it looked like she was having much fun. The pictures are colorful enough to hold her attention so that she will complete the project, but the overall process is not challenging enough as a puzzle. I would say this product does have educational value, but it is somewhat less than I expected.